Ayr MSP John Scott has stepped up his campaign to have a 20-minute rail service introduced between Ayr and Glasgow by raising the issue at Question Time in the Scottish Parliament this week. Mr Scott, who for several years has pressed successive Transport Ministers about the need for an increased service, believes that the improvement is needed to give a better standard of service to local commuters and to help businesses in the area, including Glasgow Prestwick Airport. John Scott said: “The line between Ayr and Glasgow is one of the busiest commuter routes in Scotland, and I am convinced that the introduction of an additional service each hour, increasing the frequency of service to one every 20 minutes, would be a huge boost to our area. 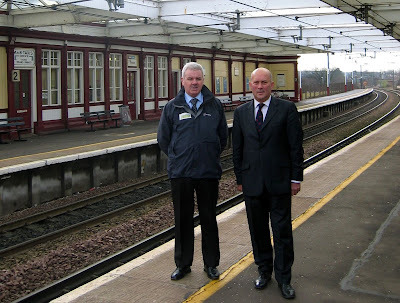 “Many local people commute between Ayr, Prestwick, Troon and Glasgow on a daily basis, so it seems only sensible to look to further expand the use of rail as a convenient and environmentally-friendly means of transport locally. “Another crucial consideration is the forecast of hugely increased passenger numbers using Glasgow Prestwick Airport over the next decade and the need, which was stressed in the airport’s new Masterplan, to improve local rail and road links. Prestwick Airport, many other local businesses, and Ayrshire as a whole would benefit greatly from a 20-minute rail service between Ayr and Glasgow. There are currently 409 Ayrshire business stories permanently archived on this site. To locate those of most interest to you, please use the site search facility in the top left hand corner of this page. Type your search term in the white box, then click “SEARCH BLOG”.